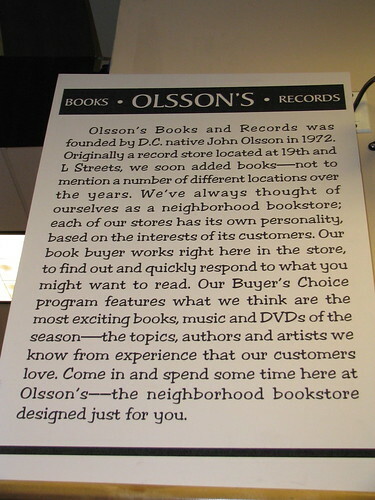 Olsson’s Books and Records has shuttered their last four locations. Remember, it may be cheaper to buy online or from a big box store, but you’ll never beat the locals for personal attention and local knowledge. Local business owners are your neighbors. The same civic quality-of-life issues that matter to you matter to them. If you don’t support them with your money*, they will fail. *I am not suggesting that you spend your money unwisely. Obviously, if you can’t afford to buy a book at your local bookstore, you shouldn’t do so just to help keep them afloat. But I can live in a world without Amazon a whole lot more comfortably than I can in a world where small businesses are shuttered. Category: books,dc life. There is/are 1 Comment. One of the main perks of living in a nation’s capital is that periodically there is an intersection between government, tourism, and residents. 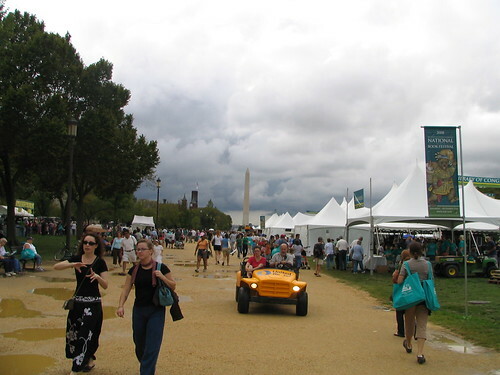 The Library of Congress’ National Book Festival down on the Mall is one such co-mingling. An annual event for the past eight years, the Book Fest is a pet project of Laura Bush. It remains unclear whether the event will continue as the administration changes, but it was obvious from many of the remarks from authors and presenters that there is hope that funding will be found. Category: arts,books,dc life. There is/are 2 Comments. 1. While home sick, I put the tv on in the afternoon and listen to reruns. (Reception isn’t so great on the stations that show old tv shows.) Britcoms come on first — As Time Goes By, Are You Being Served, and All Creatures Great and Small. Then I leave PBS and switch to MASH, Hanging with Mr. Cooper, and the Steve Harvey Show. When you’re not feeling great, reruns make good medicine. 3. The Saturday night movie is Casablanca. It’s one of those perfect movies — great director, great writers, perfect staging, and amazing chemistry between not just the romantic leads, but also between the primary and secondary characters. I highly recommend combining a viewing with pizza and your best guy or gal. I’m disappointed. Let’s work on this. Fellow alums, Professor Niering’s legacy may demand that we contact the administration about this paltry grade. monday morning music (for me): welcome fall! Since I was sick Monday and yesterday, I missed both Monday Morning Music and the autumnal equinox (a word to be admired for having both an “x” and a “q” in it). So we’ll celebrate today. You don’t mind doing it again, do you? I’ll give you two songs just so you don’t feel slighted.